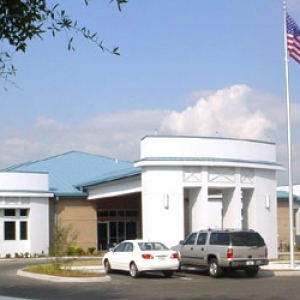 The 15,000 square foot building serves communities in east Hillsborough County including Bloomingdale, Valrico, Lithia and FishHawk Ranch. It houses a collection of over 105,000 items for all ages - a broad range of popular fiction, nonfiction, DVDs, music CDs, books on CD, periodicals and Spanish language materials. A separate genealogy room contains books and online resources to aid family history research. The Children's Room provides a kid-friendly space for pre-school and elementary age customers and their parents or caregivers. In addition to the collection of children's books and DVDs, the room offers computers configured just for kids and child-sized tables and chairs. Online and Internet access is provided through library computers, a computer lab and WiFi connectivity. The library routinely offers a variety of programs and computer training classes for children, teens and adults. To make check out of library materials fast and easy, the library is equipped with state-of-the art RFID technology - including Express Check stations for customer use. Public meeting rooms at the Bloomingdale Regional Library include the McLean Community Room (named to honor members of the family that formerly owned the land where the library is sited) and three other rooms can be used for quiet study or small group meetings.